Father Christmas and Me, is the third book in a series of Christmas books by Matt Haig, with ‘A Boy Called Christmas’ and ‘The Girl who Saved Christmas’ being the first two. In this story we get to meet Amelia Wishart, a young girl who feels that she doesn’t belong anywhere after the death of her mother and a father nowhere to be seen. With no-one to look after her, Amelia ended up at Mr. Jeremiah Creeper’s Workhouse. That was until Father Christmas took her, and Mary, who worked in the kitchen, to his home in Elfhelm, a magical place that is not visible to humans. Elfhelm is a magical town, filled with laughter and joy. The villagers, mainly elves and pixies, are mostly happy little people, until Father Vodol, a very bad elf starts causing trouble (again). This time he is trying to get rid of Father Christmas, Mary and Amelia, and will do everything and anything he can to succeed and banish the humans from Elfhelm, along with ruining Christmas for everyone too. Will Father Vodol succeed, or will Amelia be able to prove that Vodol is spreading fake news, show the folk of Elfhelm just how bad an elf he really is and save Christmas? 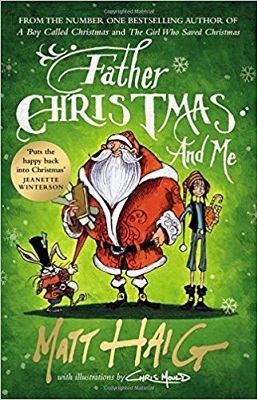 I didn’t realise when I read Father Christmas and Me that it was the final part in a trilogy, which does mean that although starting at the beginning is best, it can be read as a standalone too. The book is filled with magic and goodness, but also a reminder of how bad some people can be, and how fake news can travel fast, causing lots of people pain and heartache. Amelia is a lovely little girl who through no fault of her own, has had an awful childhood. That was until Father Christmas saved her. She isn’t completely happy in Elfhelm and still doesn’t feel like she fits in perfectly, as she has to attend elf school, where she is taller than all the other children, and the adults too. Plus Elf school work isn’t like human school work, so she doesn’t feel as clever as all her elf classmates. What I like about Matt Haig’s books is how he can make you become emotionally attached to his characters, whilst entertaining you with his superb stories. He sprinkles a little bit of magic onto each page and has children excited to read and use their imaginations, in an age where it often feels like technology has taken over and books are being left behind. This is an exciting, adventurous book that is a little bit zany, but is a whole lot of fun. It includes lots of amusing illustrations by Chris Mould. Plus you also get to discover why you receive chocolate eggs at Easter too! I am a writer. The stuff I’ve written includes novels, screenplays, children’s novels and journalism. My novels have now been translated in 29 languages. My first novel, The Last Family in England (2004) was a UK bestseller. It was an honour when one of my favourite writers, Jeanette Winterson, called it ‘among the great animal books.’ It was a Daily Mail Book Club selection, and the film rights have been sold to Brad Pitt’s production company. The very talented New Zealand film-maker Taika Waititi has written a brilliant screenplay and plans to direct the film. I was born in Sheffield, Yorkshire in 1975. Since then I have lived in Nottinghamshire, Ibiza and London. I studied English and History at Hull University and then did an MA at Leeds. I live in Brighton with the writer Andrea Semple and our children Lucas and Pearl. And in 2009, I won the Yorkshire Young Achievers ‘Achievement in the Arts’ Award. I seriously was crossing my fingers hoping that you would love this book because I really want to read it and I didn’t want it to be bad. 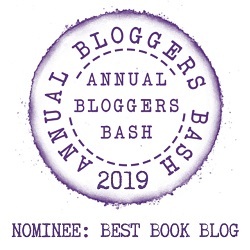 I’ve read a few Matt Haig books, though I’ve only reviewed two. I’ve not read a book of his I didn’t like. What a good book. Sounds like something I need to read. Awwwwww this book is adorable! This sounds adorable and like it would be a fun movie series. Is this a children’s book? Fantastic review! It’s now on my TBR pile!